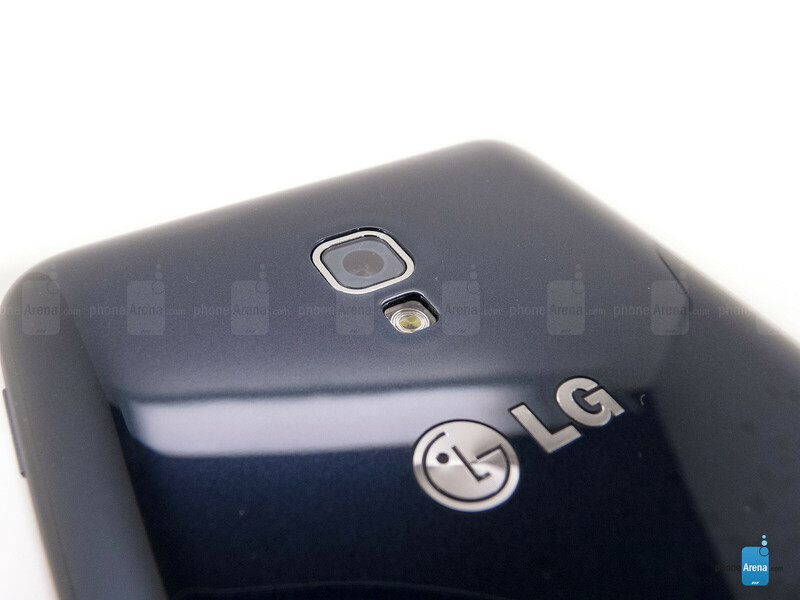 It was with great fanfare that LG introduced its flagship device this year, the G2. 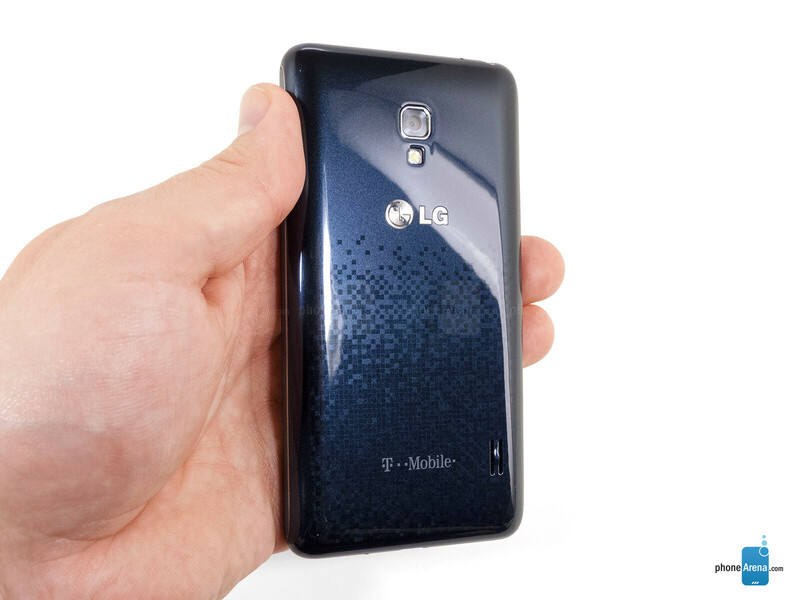 Lost in the shuffle at the time was T-Mobile’s announcement that it would be joined by the Optimus F3 and F6 on the carrier, giving smartphone buyers a choice at each step of the smartphone spectrum. 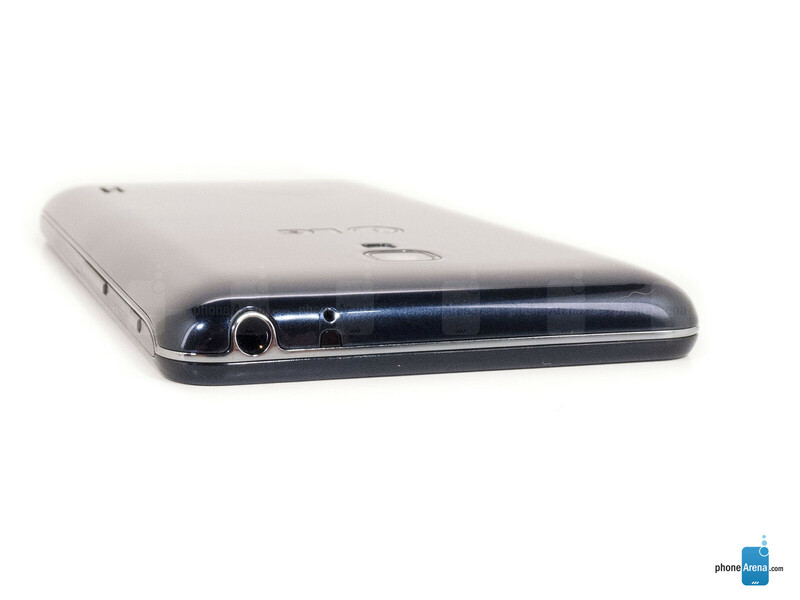 The Optimus F6 falls squarely in the middle of the high end G2 and entry level Optimus F3. Features include a 4.5” IPS display, LTE support and a dual-core Snapdragon processor, but can they outweigh the compromises made to keep the device affordable? 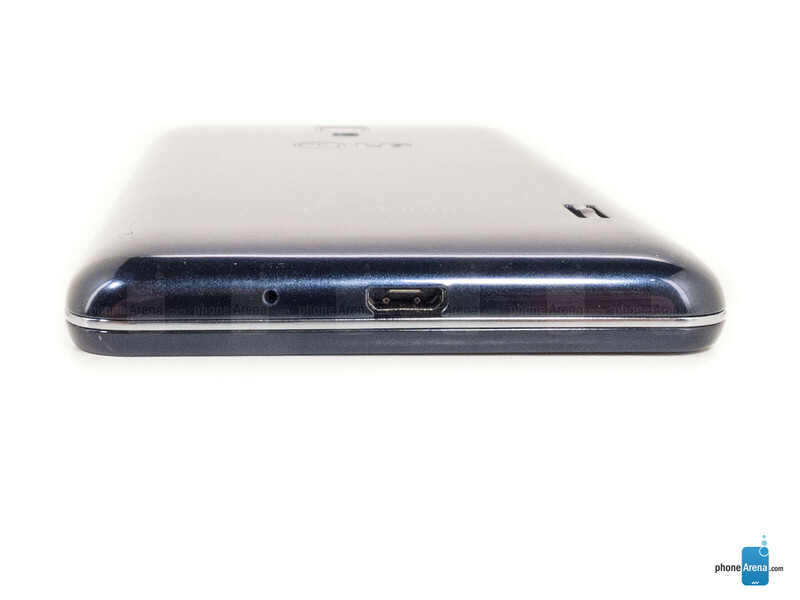 The Optimus F6 sticks to the basic design principles that LG has used on previous mid-range devices, and while it may not grab your attention the F6 is a good looking device. 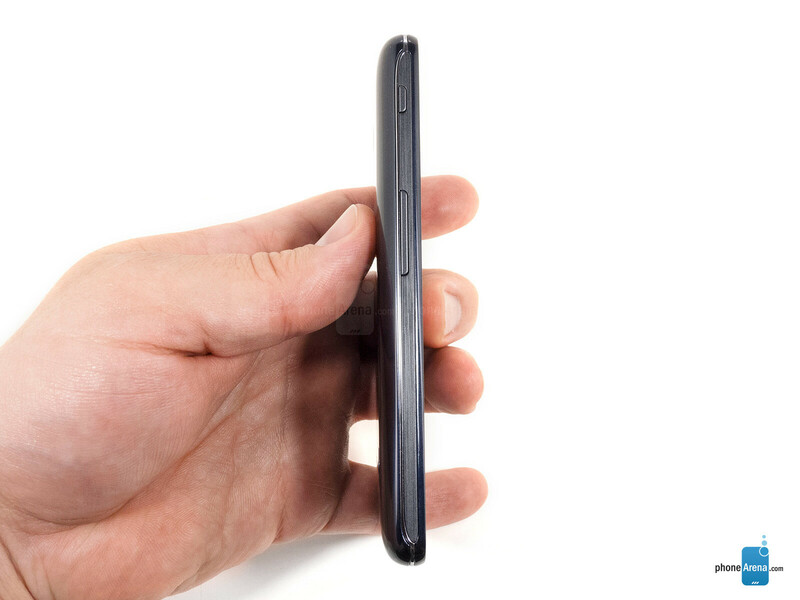 It is more rounded than the Optimus L9 it replaces, but the two devices share many other design elements including the physical home button below the display. Around the edges you’ll find the usual array of buttons and ports, with two exceptions. The first is an IR port next to the headphone jack up top, and the second is a dedicated QuckButton key above the volume rocker on the left. By default the QuickButton opens LG’s QuickMemo, allowing you to make notes or doodle over the current screenshot, but the button is configurable and can launch any app installed. If you set it as a camera shortcut it will double as a physical shutter button. While the button placement is a bit odd, we really like the customization offered here. We would prefer the volume rocker be a bit larger and for a bit more travel to the side buttons, although there is a tactile click when you activate one. 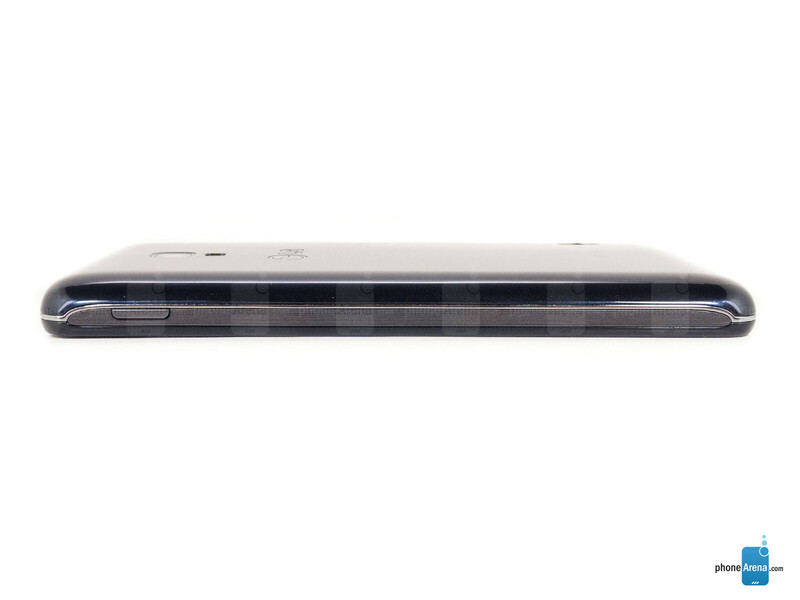 The dark blue battery cover has a subdued digital pattern to it. 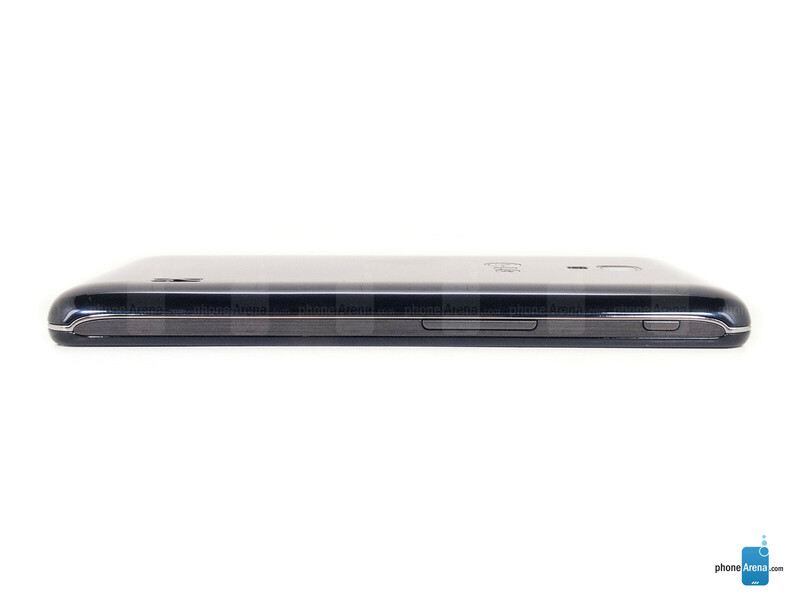 The 5 megapixel camera with LED flash resides up top, and the phone’s single speaker at the bottom. The Optimus F6 is constructed entirely out of plastic- not out of the ordinary for mid-range phones- but avoids feeling cheap. The build quality is good, with tight seams and no plastic creak. It feels good in the hand, if not a bit slippery, and is up to par with similarly-constructed Samsung devices. The Optimus F6 features a 4.5” IPS display, which we really like, but only a 540x960 (qHD) resolution. That makes for a slightly underwhelming 245ppi, although there are certainly worse displays out there. It is easy to read at extreme angles and in harsh light, with good color and strong brightness. Thanks to these secondary features media generally looks natural and crisp, although individual pixels can be seen if you look. It is one of the better displays you can hope for on a mid-range device, although it does not compare to even last year’s flagship devices and their HD displays. If LG was merely just a copycat... that would be the least of their worries, but they are selling a very poorly designed phone and trying to pass it off as a smart phone. It should be illegal to call this phone smart, since its anything but smart. A smart phone should automatically use the external SD when there is no more internal storage available. The LG F6 does not use the External SD, so your phone will lock up constantly because its constantly out of storage. The pre-installed apps pretty much use up all the internal storage, so you then have to manually rename Folders or Files and then move them to your external SD card. 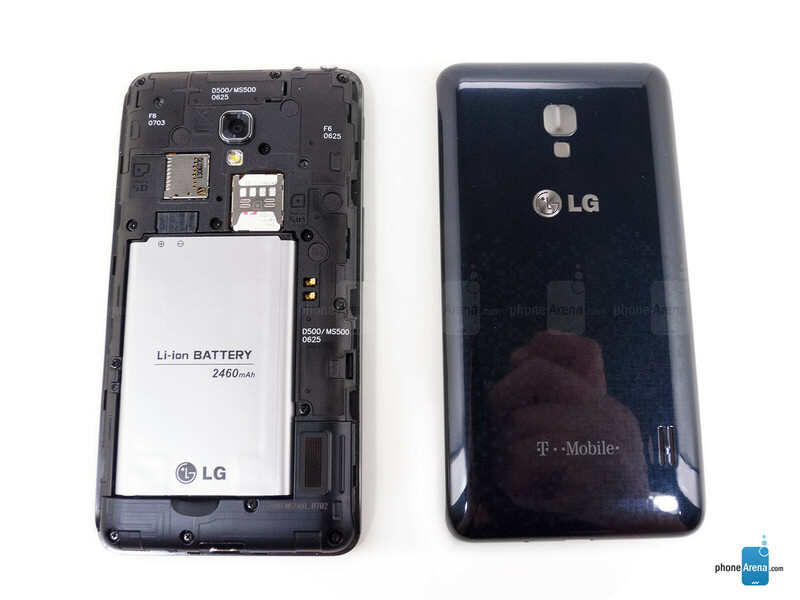 Until this is done, your LG F6 phone is pretty much in a useless state. "I believe" the only folks that give this phone a good review is because they only use it for calls and minor texting. "If" you wish to use a Smart phone's features to any degree... DO NOT BUY THE LG F6 !!! This phone is absolutely HORRIBLE. p.s. I've returned 4 F6 phones already and on the 5th one... they all work this way. So its not a bug of one or two specific F6 phones, its just a major design flaw. Why would you keep purchasing this phone, only to return it? Are you trying to make a point, or are you just stupid? It's the carrier's policy to exchange the same model only... plus they claimed they were defective units, which isn't the case. But yes, I've had my share of stupid moments... like this one - being wasted replying to you. I've never seen somone so mad at a phone, why didn't you just root it??? It will do wonders. I'm only guessing, but probably less than 1% of people in the world know how to root a phone... and even less would want to void a warranty of their brand new phone. But thanks for the advice. I've cooled down now and not mad anymore. The LG G2 works great. Yes, I went with another LG... tested it thoroughly during the 14 day window, and fell in love with it. We now have 3 G2s in our family. Hey I'm having the same problem with my f6 optimus and I'm so agitated cause I couldn't download any apps the only apps I had were the ones it came with and I added a 32GB fore external storage. How do I root it.... #help please!!! Still the Samsung Galaxy Core gets a 8.0 rating. I think phonearena will update their site for people to preorder Samsung devices easier. Can someone explain why a pixel density of 245 is low (this phone) and a density of 162 on the iPad mini is average? (phonearena.com/phones/Apple-iPad-mini_id7523) Everyone agrees that a pixel density below 180 is very poor! Yet they rate the mini as average and this phone as poor? Whats the middle ground? Does PA think that Apple products with crappy screens are good, but when the pixel density goes to 250 its still low for everyone else! PA needs to rethink their standards, its all over the map! below 200 - poor/low 200-300 - average/mid range 300-400 - good/high 400-500 - excellent/outstanding HOWS THAT FOR A PROPER STANDARD? THAT ALL PHONES / TABLETS FOLLOW! I know that I have a much higher level of education than most of the journalist/editors at PA, but I shouldn't have to make a chart that you all should follow and understand. You need to improve your standards because your work is below average for a professional organization! Yes, I can explain, but you might want to seek explanation before you go on an uninformed rant next time. The reason tablets follow a different standard than phones is that you hold the tablet farther away from your eyes than a phone. The visibility of pixels is directly related to the distance the screen is viewed at. The whole reason anyone cares about pixel density is directly related to the visibility of pixels. Once this visibility level reaches "retina" level the image is as sharp as possible, leaving aside other factors. hi Brian, great review. any way to follow you - Twitter, G+ etc? Thanks for the great reviews. The person that reviewed this phone obviously didn't spend very much time using it. It has serious design flaws or bugs... take your pick. DO NOT BUY this piece of junk. 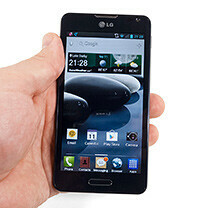 The LG F6 Optimus will not use external SD card when it should, and runs out of memory and storage constantly. The Errors you will continue and constantly receive are "Low memory space" and "Storage space is running out". So you have to constantly manually move photos, files and other items from the phones internal memory to the external. I am very upset with this purchase! As for the general aesthetic features of the product... they are fine.. Call quality is only fair. Note: I've returned the phone 3 times on 4th LG F6 Optimus Phone now, and that Mobile carrier that starts with a "T-" won't exchange it for a different model due to policy. Buyer BEWARE!!! Both of the carrier and this phone model. FYI: I am a very experienced user and in IT... I've owned and used many Android phones, and never been disappointed with any of them... from top of the line Samsungs to bottom of the line free phones, this one is the worst! Wow... if I only knew! Thanks for the genius advice. You should write reviews of phones. This phone, once rooted, is amazing. People who do not appreciate this phone have little knowledge of android devices/smartphones and how to manipulate them. Rooting this phone takes only a few minutes and then you can get rid of all the bloatware and install apps to your external SD card. Problem solved!!! 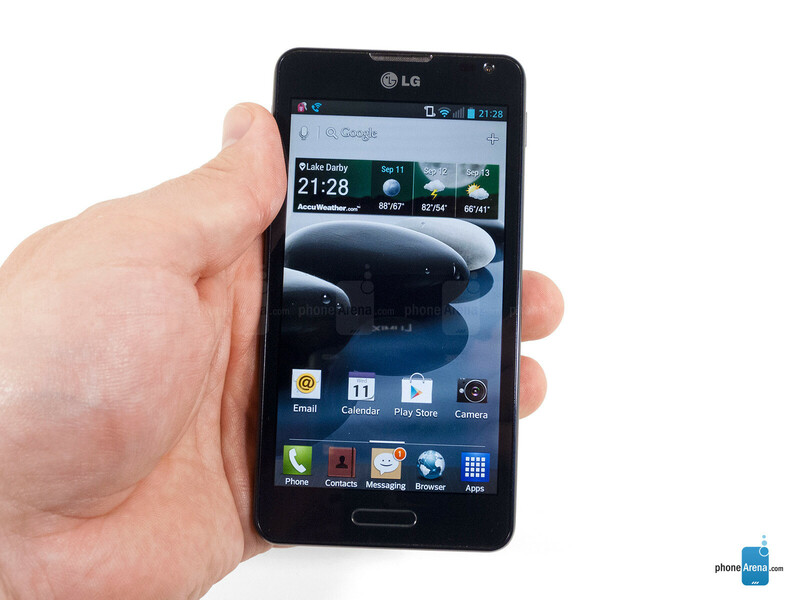 Just look up any forum on google for how to root LG Optimus F6. XDA developers is a really good website on how to do it.